I'm definitely feeling optimistic now. The Lyonnais terminal is particularly striking. *It totally evokes a bird in flight, especially the head-on views in the fifth and sixth pics. *That would definitely be a form to follow if PATH is ever extended to Newark Liberty Station. Here are some others of the Galleria. The towers forming part of the complex that the Galleria ties together. Santiago Calatrava designed the $100 million addition to the Milwaukee Art Museum. The site plan represents the destruction of Sept. 11. Now the architecture will provide the creative response. That's the implicit message in the selection of Santiago Calatrava to design a permanent replacement for the PATH station that was destroyed by the attack on the World Trade Center in 2001. At last, the controversial plan developed by Daniel Libeskind for the site begins to make sense. From it, great things might grow. Mr. Calatrava, 52, is the world's greatest living poet of transportation architecture. A native of Spain, Mr. Calatrava trained as both an engineer and an architect. He is best known as a designer of bridges, train stations and airports, masterworks of our time. Long before the word "infrastructure" had entered the lexicon of contemporary architecture, Mr. Calatrava had taken this genre of design to the level of genius. Though his main office is in Zurich, in recent years Mr. Calatrava has been living part time in New York. His first American project, a time capsule designed for The New York Times, is displayed at the American Museum of Natural History in New York. The Milwaukee Art Museum addition, his first major public building in this country, opened last year to critical acclaim. Mr. Calatrava is also well known in New York as the architect of a project as yet unrealized: a new transept and spire for the Cathedral Church of St. John the Divine in Morningside Heights. Admirers have long detected a spiritual dimension in Mr. Calatrava's secular work, particularly in Spain. The Communications Tower and City of Science complex, designed for Valencia, has the tripartite arrangement of a Gothic cathedral. The Montjuic Communications Tower in Barcelona gestures skyward like a waving hand, as if to consecrate the air through which electronic messages pass. Inevitably, with its taut cables suspended from a single inclined pylon overhead, the Alamillo Bridge in Seville sparks images of celestial harps. Some structural engineers have criticized Mr. Calatrava for including expressive forms not strictly required by functional needs. That is like attacking an apple for not being an orange. 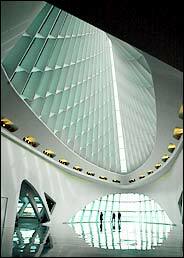 Twentieth-century functionalism is only one of the cultural strains on which Mr. Calatrava has drawn. His sources also include geometry, human anatomy, animal skeletons and other natural forms. Kinesthetics, the perception of movement, is also central to his work. It harks back to a time when expressive form in architecture stood for exuberance and generosity, not a failure to economize. The choice of Mr. Calatrava is the clearest sign yet that the rebuilding of ground zero will be an achievement of cosmopolitan dimensions. The city has come far from the time, just more than a year ago, when it had entrusted the design process to a local group of insiders bereft of a vision adequate to the historical challenge before them. It is doubly amazing that this sign of serious intent should be issued by the Port Authority of New York and New Jersey, an agency whose architectural standards in recent years have slipped comfortably downhill. Some New Yorkers who have been following recent developments at ground zero may find themselves secretly hoping that there will be fireworks between Mr. Calatrava and Mr. Libeskind. They may get their wish. In the past several months, Mr. Libeskind seems to have forgotten that he was retained not to design buildings, but to assist the Lower Manhattan Development Corporation in preparing a master plan for the 16-acre site. The corporation appears to have forgotten this, too. It seems that the louder Mr. Libeskind has voiced his demands, the more control he has been awarded over the design of buildings planned for the site. And the state agency has yet to produce an actual master plan. In his presentation to the agency last December, Mr. Libeskind called for "great architects" to help realize his vision. A client would not, in any case, hire a designer of Mr. Calatrava's stature simply to execute the ideas of an architect who has given some New Yorkers cause to fear that he may have difficulty distinguishing sunlight from shade. With architects of the quality of Mr. Calatrava, many New Yorkers will find it easier to appreciate the value of Mr. Libeskind's original inclusive approach. A stylized re-creation of the shock waves felt around the world on 9/11, the Libeskind plan has aroused opposition on the grounds that it would inflict a perpetually open wound on Lower Manhattan. The wound would serve a constructive purpose, however, if it were surrounded by unmistakable signs of the city's resilience. Memory Foundations: that is the name of the proposal Mr. Libeskind submitted last year, and it is a good one. There is much to be remembered on this site, much life along with death. And we must learn to see this project literally as a re-membering, a putting together of pieces that have been violently torn apart. The wintergraden at BCE Place has French exhibits and tours and notably a French restuarant, Marche. If Im not mistaken the Hockey Hall of Fame is either adjacent or part of the complex, that alone would never fly here. But Im hoping for an American, freedomized version, and I realize it sounds tacky. Downtown Toronto has more life than NYC though, and people magnatize there, we can learn something. The Hockey Hall of fame is in one of the older buildings, the old Bank of Montreal Building, saved from demolition, that was incorporated into the new complex. But Heritage Square, what you call the winter garden, has rotating exhibits, free concerts, etc. The complex is also tied to the Underground from which one can connect to most of the buildings in Downtown Toronto- from Union Station to City Hall. How quickly our opinions change. Ive already forgotten. In a sense, Libeskind and Calatrava are like night and day and my reservations about their collaboration are the same I had when the possibility of a partnership with Foster was evoked for the Freedom Tower. Their architectures are rationalist, as opposed to Libeskind's freer expressivity (not restricted by structural logic). They are more classical in their belief in order, harmony, and derive their clear structures from natural forms - especially Calatrava. Libeskind has a more contemporary and subjective symbolist approach which I doubt is compatible with theirs. Respective roles should be well defined. Beyond the skeletal appearance of the station's sketches, I see few commonalities. I hope the MTA is using standards as high in the selection of an architect for the neighboring transit center. Maybe with this, Fulton St. and the new "Penn" NY will actually have some beautiful places to catch mass transit again. *Nice to see. True. *This will only happen downtown if they actually connect commuter trains to the station. *Otherwise it is just another subway transfer station. *LIRR, NJT and JFK need connection here. *I doubt that they would go to all the trouble of building a "downtown grand central" and not make it grand. I have to agree. *I would bemore impressed with a transportation hub that can get me anywhere, than a beautiful structure that can only get me on a subway or PATH line. *LIRR and NJT would be great - but the key is one stop monorail service to JFK - Newark &amp; LaGuardia. Now, THAT would be a hub. *This of course has little to do with the design of the facility. This architect selection is very pleasing to me. The PATH extension to the Newark Airport Rail link station is almost a given, the next step would be to build the new East River tunnel to allow LIRR trains from Jamaica and JFK Airtrains to operate over the Atlantic Ave branch to the new Fulton Street station. Incorporating the Corbin building into the Fulton street station and extending the LIRR Atlantic Ave branch to the new transit terminal would be a great tribute to *Austin Corbin who formed the LIRR. Im really excited about the news of Mr. Calatrava being brought in to design the new World Trade Center transit complex, I've seen his work in a great book called "station to station" which depicts great train stations. With his experience and Libeskind's vision this is going to become a NY land mark of grandness that *has not been built in a long time. Building the PATH EWR extension and the LIRR extension will solidify this new station's status for Centuries to come.